There’s just something about casseroles that make my world go round. They are warm and comforting and as the temperature continues to drop, they are just perfect. We’ve been going kind of casserole crazy around here; and stuffed shells had to be thrown into the mix sooner or later. I’m not a HUGE fan of your everyday red sauce and ricotta stuffed shells. Sure they are tasty, but really, aren’t they just a glorified form of lasagna? I mean it’s pretty much the same thing, just assembled in a different order. When we make stuffed shells, we tend to make them a little bit different. These seafood stuffed shells are perfect for this time of year. Sure, they may be knock you off you feet in heaviness. Oh, and you may only be able to justify eating them once a year, since there is enough cheese and heavy cream in this recipe to really clog your arteries. Hey, we have to splurge once in a while. It really is delicious though. Don’t let my rants scare you. Really, it’s delicious. I promise. I find that for a recipe like this, going frozen and canned for seafood is A-OK.
Ok, maybe I’m just saying this because I live in the middle of Colorado and the chances of getting fresh seafood, even if it has been frozen, are very slim. So anyway, because of the slim pickins that is seafood in Colorado, I have to find alternative means for incorporating the stuff. For seafood salads and mixes, I tend to go the canned crab route anyway. Trust me, you won’t even notice it’s not the fresh stuff once it’s doused in a garlic cream sauce =). If you have the luxury of living in Maryland, then you know what to do. I have mentioned that Speakeasy is being sold in our area. We are kind of obsessed with it. I thought an IPA would go great with this recipe. Even more so, I thought an IMPERIAL IPA would go even better! Speakeasy’s Double Daddy is just divine. It is sooooo smooth for an Imperial IPA! It is hoppy. It is dry, but I think it is the dryness that pairs well with this recipe. Normally, if I were pairing this dish with a glass of wine, I would go with a dry white. Double Daddy and this dish really compliment one another. You can’t go wrong. Oh, and the bottle is just so freaking amazing, so ya know. Happy Wednesday everyone! Have a great night! Stuffed shells don''t have to be all about the red sauce. 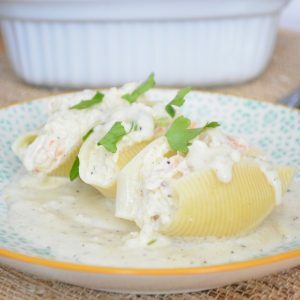 This stuffed shells recipe is packed full of seafood and topped with a cream sauce. Cook your shells per manufacturer''s instructions, making sure to salt your pasta water. Drain through a colander and set aside until you are ready to stuff them. For the seafood filling, heat 1 tablespoon of olive oil in a small non-stick skillet. Add the shallot, green and red bell peppers. Season with salt and pepper and cook until tender, approximately 4-5 minutes. Remove from heat and set aside to cool slightly. Preheat your oven to 350 degrees F and grease a 9x13in baking dish. Set aside. Stuff each shell with a tablespoon of the seafood filling. Place in the 9x13in baking dish. Repeat this step for the rest of the shells. You should be able to fit about 20-24 shells in the baking dish. Once you have stuffed all of your shells, set aside. To prepare your sauce, melt 6 tablespoons of butter over medium heat. Add the yellow onion and saute for 4-5 minutes or until tender. Add the garlic, salt and pepper and cook for another minute. Very slowly, add the flour into the pan. Whisk until the butter and onion have absorbed the flour and all of the rawness from the flour is cooked out, approximately 3-4 minutes. While you continue to whisk, very slowly pour in the heavy cream and the whole milk. Keep whisking until all of the ingredients have been incorporate, approximately 2-3 minutes. Add in the seafood seasoning and more salt and pepper to taste. Let cook for 10-15 minutes or until the sauce has thickened substantially. Add the fontina cheese and stir to melt. Pour the sauce over the shells, reserving about a cup for later. Bake the shells, uncovered, for 25-30 minutes or until bubbly. Remove from oven and garnish with parsley. Serve with extra sauce. Enjoy!